SHF #17: Blackberry Buttermilk Panna Cottas - Do You Know The Muffin Man? Andy is hosting this month's Sugar High Friday with a theme of dairy (roundup here). 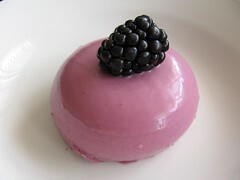 My contribution for the 17th installment of this food blogging event is a blackberry buttermilk panna cotta. The original recipe includes a compote as well but I skipped making that. I don't make these Italian “cooked creams” all that often; this is probably the second or third time in my life that I've prepared one. But for a dessert that highlights the essence of milk and cream, a panna cotta is an obvious candidate. Anyone can make this: it's just a simple fruit-and-cream mixture set with gelatin, suitable for those times when you want something that isn't very fussy. This recipe nicely balances out the blackberry and buttermilk's tartness with just enough sugar, while sieving twice makes sure that every spoonful melts in your mouth.